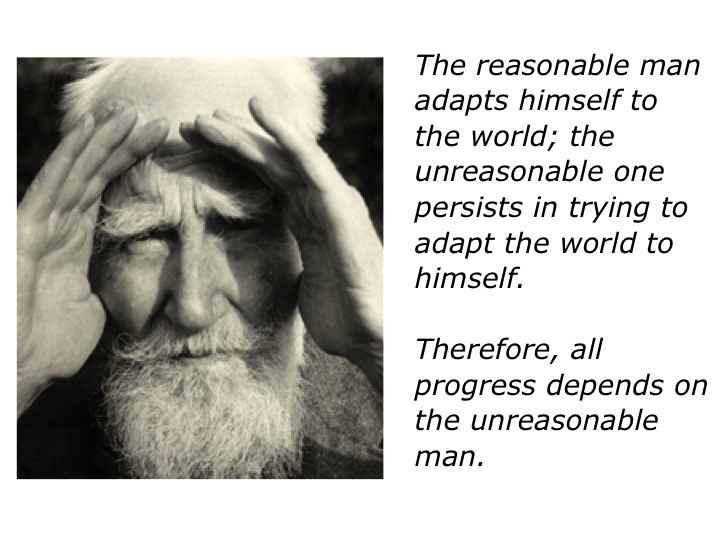 The Unreasonable Group’s approach is based on the famous quote by George Bernard Shaw. Below are excerpts from its main website and related projects. You can discover more via the following links. This summer marked the first annual Unreasonable Institute and a few remarkable events took place that caused our founder, and the founder of the Institute, Daniel Epstein, to see a larger opportunity. The Unreasonable Institute looks at the same metrics that all accelerators for early stage companies track. That said, the Institute also has two entirely uncommon indicators of its impact. These “uncommon metrics” revolve around tattoos and equity… Nope, we aren’t making this up. By the time the first Unreasonable Institute had come to an end, a number of the Institute entrepreneurs had gotten a tattoo of the Unreasonable logo, on their body, for the rest of their lives. Furthermore, many of the entrepreneurs decided to donate equity back to the Unreasonable Institute, after the Institute was over and after they had returned to their home countries. The two things in life you can’t divorce from are tattoos and equity and yet the entrepreneurs who came out of the first Institute, and many of those proceeding, willingly got tattoos and desired to donate equity back to the Institute… we took note of this. Beyond tattoos and equity, a greater story emerged. A number of the entrepreneurs in the Institute came to Daniel and said they wanted to change the name of their business. When Daniel asked them why they desired to rebrand their already profitable companies to Unreasonable “x” the entrepreneurs told him they were convinced it would increase their impact and their bottom line, it would connect them into a global unreasonable family, and it would bake the intention of what they were doing into their companies. In short, tattoos, equity, and the desire of founders to re-brand their businesses, made us realize Unreasonable didn’t just need to be an accelerator program, but it could also become a brand licensed to and shared by the companies who came out of the Unreasonable Institute. Our goal today is to work with companies who come through the Institute or are internally launched, and who, most importantly, share our values. By 2020 we have the aspiration of seeing at minimum 50 companies operating in 50 countries under the banner of Unreasonable and all leveraging ingenuity to solve the greatest challenges of our time. Capitalism is seeing a shift as significant and as large as the industrial revolution. We are living amidst an Entrepreneurial Renaissance. This fundamental shift in the way we go about and think about business is a trend that transcends all verticals and sectors. We need a brand that does the same. The goal of Unreasonable is to help catalyze and support this movement by leveraging our brand to accelerate the next generation of entrepreneurs, funds, and companies. Unreasonable Group is dedicated to a new mode and new way of going about business. One that takes into account the value of all stakeholders involved, that is dedicated to transparency and vulnerability, that is pathologically collaborative, and one obsessed with leveraging profit to solve “BFPs” (Big F***ing Problems). To use an analogy, we hope to become the “Virgin” for the 21st century. Today, Virgin has over 400 companies in 40 countries that are part of the Virgin Group. We are striving to launch at minimum 50 companies operating in over 50 countries, all under the Unreasonable brand, by 2020. For us, this benchmark, if achieved, will only represent the beginning. Will it work? Time will tell. We are the first to admit that we are shooting for the moon and that all of this is a massive experiment. That said, we hold the conviction that there is no experiment more noteworthy than this one and we can’t convince ourselves out of giving it a shot. This website is a multi-channel blog and video library for those hungry to solve BFPs. Each day we publish a featured post authored by some of the greatest thinkers and doers of our time and focused on big opinions and practical hard skills. And this is where our fundamental bias kicked in. We believe “entrepreneurial thinking” is the most powerful tool at our disposal for solving the problems of the 21st century. We are die-hard about focusing on the nitty-gritty of how to start, scale-up, and re-define business and entrepreneurship in a rapidly changing world. So if you give a damn about making this world a better place… You’ve found your new home. * We can’t thank our friends at GOOD enough for the “who give a damn” inspiration.